What does a Huddle House Franchise Cost? Does your community need a gathering place, where customers can have all-day breakfast, lunch or dinner served with Southern hospitality? If so, now is the time to invest in a Huddle House franchise. Huddle House has a 52-year history and more than 400 locations open and under development in 21 states. No prior restaurant experience is required. Open Huddle House in any of these available states: NC, OH, TX. In addition to locating in urban/suburban markets, Huddle House thrives in small towns which are underserved by other franchise breakfast restaurants. In fact, 7 of the top 10 Huddle House restaurants are located in towns under 10,000 population. 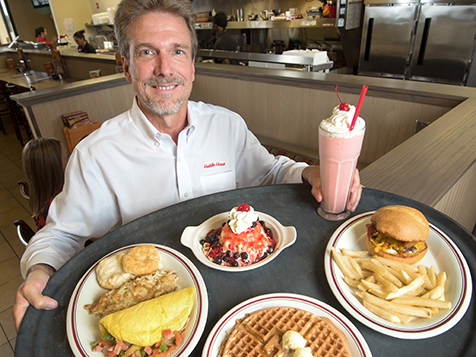 Huddle House franchisees can typically “own” their market, as one of the only sit-down options for customers. 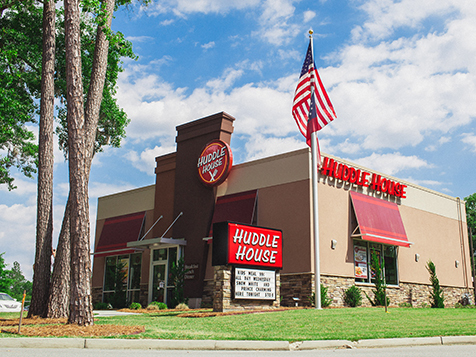 Why Should You Invest In A Huddle House? There has never been a better time to invest in this iconic American restaurant franchise. The total investment necessary to begin operation of a Huddle House franchise is $444,192 to $1,550,670 for a New Development Unit and $112,480 to $657,810 for a Resale Unit. What Makes Huddle House Unique? An iconic breakfast franchise with Southern hospitality has big portions at a fair price. Compared to other full-service, freestanding restaurant brands, the Huddle House initial investment is relatively affordable. Huddle House restaurants are smaller than Denny’s® or IHOP® restaurants, which saves money and allows staff to get to know their customers. In many small towns the Huddle House targets, they are the only sit-down restaurant with table service. The newest restaurants have open kitchens so guests can see the cook prepare their food in plain sight. Full-service 24-hour restaurant that serves any meal at any time. In addition to the limitless possibilities when it comes to opening new restaurants, Huddle House also offers opportunities to purchase existing franchise or company restaurants and reopen former Huddle House restaurants in various markets. The entire process to open and train you will take approximately 9-12 months. 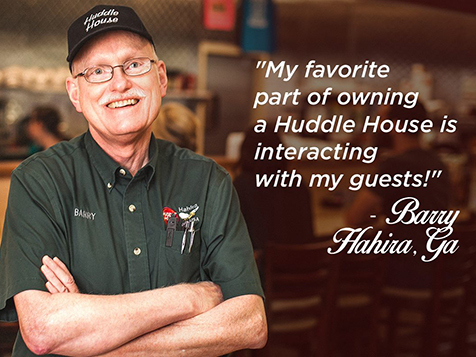 Ideal Huddle House Franchisees have a background in business and a passion for working with people. What Huddle House is really looking for is someone with a strong business background, either with experience working for others or someone who might be in business for themselves already. You do not need prior restaurant experience but you must have a plan for who will run your operations. The seasoned leadership team can teach franchisees and managers everything they need to know to run a Huddle House restaurant on a day-to-day basis. We also embrace multi-unit owners who hire general managers and oversee their franchises on a larger scale. Special Discount: To support our veterans and families of those who served in the military, Huddle House offers veteran’s a $5,000 discount.